Fresh baked bread?? I woke in the forest of Argentina to the smell of fresh baked bread. Yummy. Before leaving Chile, J&E had stopped at a bakery, but the baker hadn't baked the bread yet, just made dough. 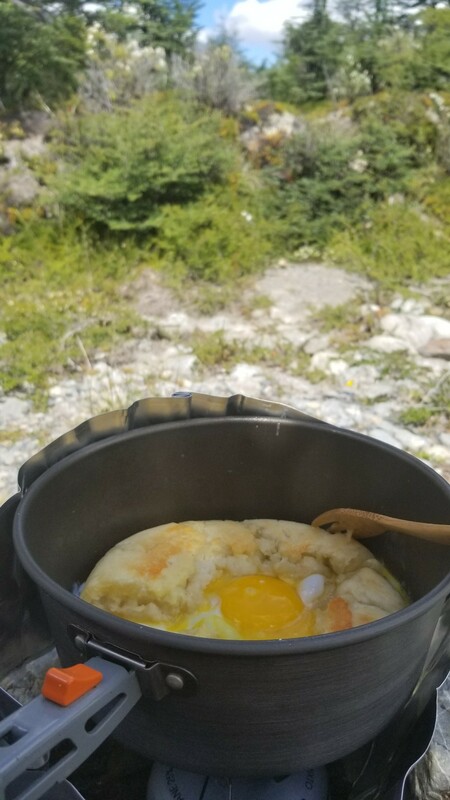 So we got a big ball of dough - Awesome breakfast for a rainy morning in the tent. No need to rush, as it was only a few kms to the next ferry on Lago del Desierto. I stayed cozy in my sleeping nook until the rain paused and E&J were ready to venture out. A few kms.... but it was ALL MUD. 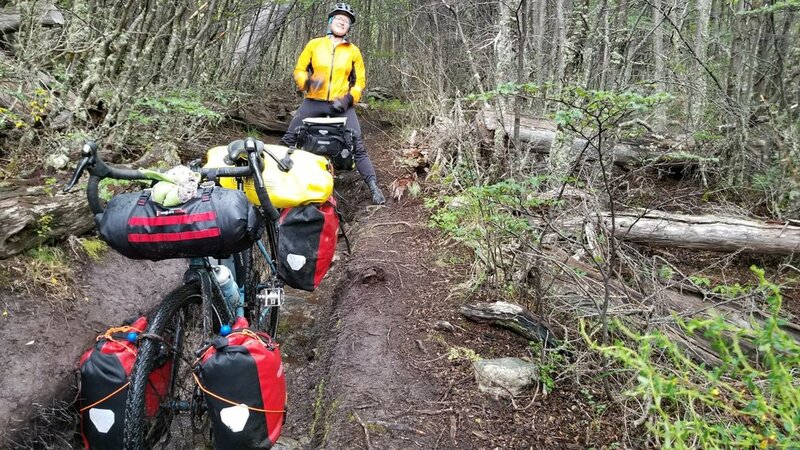 ever carry a bike across a flimsy log bridge? Neither had E or J. I was skeptical. and more muddy ruts. And then the rain turned to snow. Snow? Really? It's supposed to be summer! 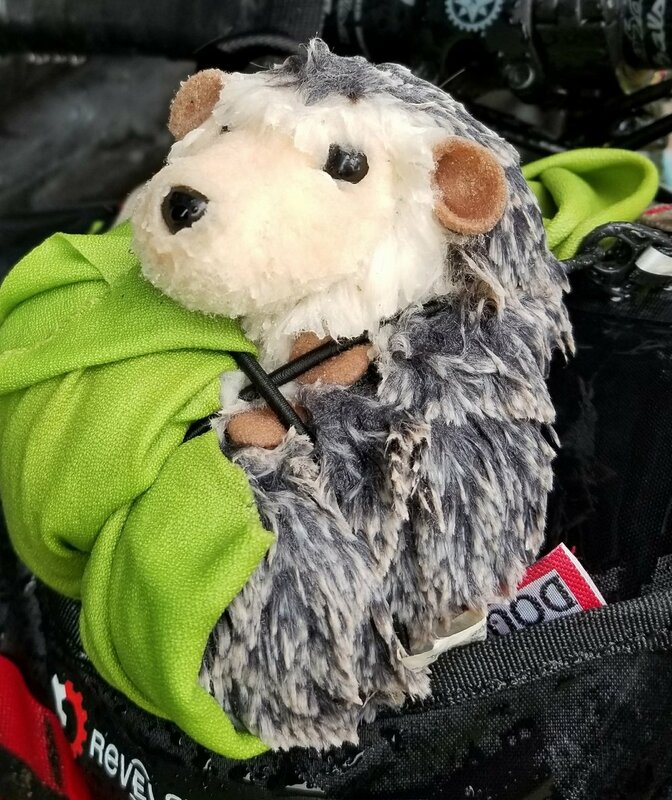 We met a few other cyclists at the tiny shelter. And then we all piled onto the little ferry. The peaks were in the clouds, with a dusting of the snow we came through. One short ride to get to the city of El Chalten - just 40k to go! More beautiful views by the river side. And at last! The city! And more mountains, spires and alpine lakes.